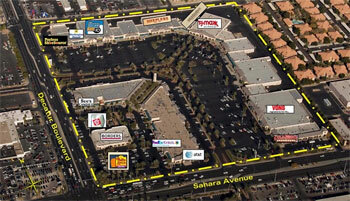 Sahara Pavilion North was once a hot spot for shopping in Las Vegas. You know the spot, the mall on the northeast corner of Sahara Avenue and Decatur Boulevard, which was once home to Vons supermarket and Borders. But the loss of Vons, followed by Borders closing its doors in 2011 sent the shopping center into foreclosure. Sahara Pavilion could have been just another forgotten shopping center at what used to be the western edge of Las Vegas. Today, however, a new owner is betting millions on the 29-acre mall. Was it a fool’s bet? Or was the $33-million-dollar purchase a sign of good things to come? “The new buyers are planning on rebranding the center … really putting money into the landscaping and parking lot,” Paul Chaffee, a partner with NAI Vegas, told KNPR’s State of Nevada. “They are revitalizing the center to attract the demographic that surrounds the center today and not when it was the western edge of Las Vegas. Chaffee described the demographic in Western Las Vegas as middle class, a change from the days when the area was home to the region’s upper middle class and wealthy residents. He said wealthier residents moved to the suburbs near the 215 freeway when that was built. 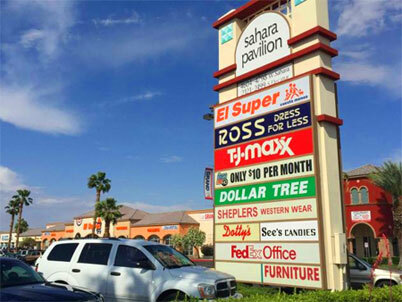 Chaffee said the sale of Sahara Pavilion to Joseph Daneshgar, of Beverly Hills, Calif., -based 3D Investments was a sign of increased interest in the region’s commercial real estate.